Good customer service has become quite rare. That’s why I wanted to point out the excellent customer service I got from LinkedIn. They were incredibly helpful even though I wasn’t actually one of their customers. I used to have a LinkedIn account. It wasn’t something I used very much, and I had honestly forgotten that I had one. About a year ago, as you may recall, LinkedIn had a security breach and suggested that users change their passwords. When I went to do that, I realized that I used the service so infrequently that I had no idea what my password was. I managed to sort that out, and then cancelled my LinkedIn account. I just wasn’t using it. Since then, I’ve gotten email from LinkedIn that tells me that one of their current users wants to connect with me on LinkedIn. For a while, I just ignored them. This week, I got tired of it. Out of frustration, I sent a Tweet to @LinkedIn. I wasn’t expecting a response, but I got one. @LinkedInHelp replied with a link that I could click on to fill out a ticket that would stop the contact invites. Doing so would put me on their Do Not Contact list. I immediately filed a ticket. A few days later, I got yet another email from LinkedIn letting me know that one of their users wanted to connect with me. 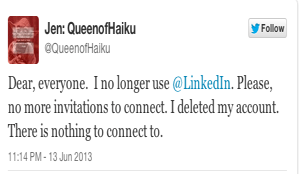 So, I sent another Tweet to @LinkedInHelp about it. The response was fast! @LinkedInHelp asked what my ticket number was, and followed me so I could sent them a direct message with the ticket number. Not long after that, I got an email from LinkedIn that said my email addresses had been placed on their Do Not Contact list. (I’d been getting contact requests at more than one address). This is impressive, especially considering that they knew that I wasn’t actually one of their customers anymore. Kudos to LinkedIn for great customer service!